Artist Amy Brown's work has inspired this beautiful figurine! A fairy perches upon a stump, as fern leaves unfurl around her. 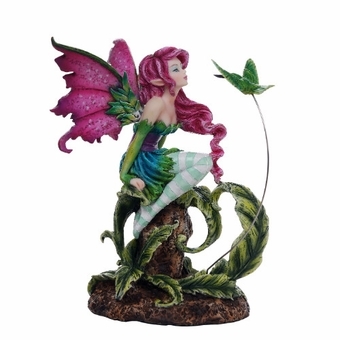 The pixie has bright magenta wings and pink hair to match, and is having an intense conversation with a hummingbird! It's a delightful addition to a fantasy lover's collection. Size: 5 1/4" x 3 1/2" x 6 1/4"